While pundits debate whether climate change is man-made or a natural phenomenon, the Pentagon and our military are busy preparing for the future climate wars that could come as a result of millions of people displaced by global warming in places such as Bangladesh, the Pacific island nations and many other hot spots around the world. That is just one of the urgent messages relayed in the film "Climate Refugees," which screened Friday night downtown as part of the Los Angeles Film Festival. The unspooling took place outdoors at California Plaza on a perfect SoCal evening with a cool breeze, clear skies, palm trees and a full moon as the backdrop. Audiences were treated to introductions from the film's director Michael Nash, environmental activist Ed Begley, Jr. and Senator Barbara Boxer with a taped video message from Washington. Boxer is one of the many dignitaries and politicians who have seen the film, which was screened at the Copenhagen Climate Conference in addition to Sundance and other film festivals. Sadly the millions suffering because of climate change are not given the same rights that political refugees get because the United Nations and other world bodies and nation-states don't recognize them. 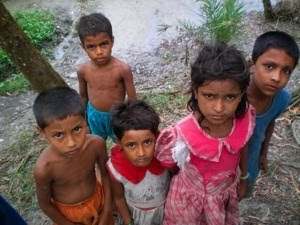 Therefore, the millions left homeless by such disasters as cyclones in Bangladesh are denied access to other countries and left to fend for themselves in a country that is literally drowning because of rising sea levels and warming waters that produce deadlier cyclones. Nash's journey took him all over the world to put a human face on climate change. "What we found was an intersection that is taking place in societies where overpopulation, overconsumption, lack of resources and a changing climate are all colliding with each other to the likes that I don’t think anyone has ever thought possible." Begley seized the moment to call for all of us to not only hold government and corporations accountable for the Gulf Coast oil spill disaster, but to also look at what we are doing to create the demand for so much oil. "The biggest vote that we have is our purchasing power -- our use of kilowatt hours and our use of fossil fuels," Begley told the audience. "We need to do everything we can to create less demand so that there is less of this happening. We need to show corporations and government that we mean business too. This is a catalyst. This is a wake-up call. We have to turn this into action." Click here for the "Climate Refugees" website and check out the trailer below.